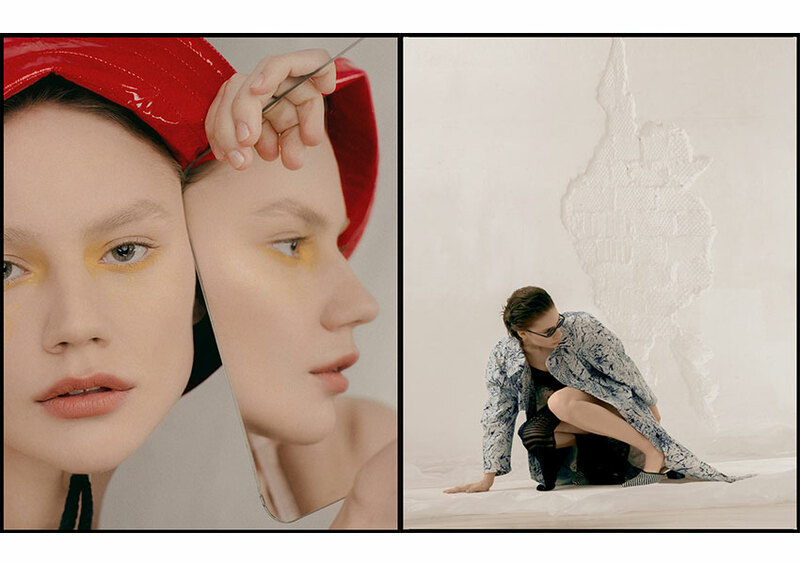 Photography by Larissa Bukar and fashion by Eliza Kiseleva. Hat by Timosha vintage. Trench by Gentlewares, dress and sunglasses by Oldnew, mules by H&M. Jacket by Gentlewares, turtleneck by Uniqlo, tights by Calzedonia, earrings by Asos and flats by Zara. Trench by Gentlewares, shirt and leggings by Uniqlo. Jacket by Gentlewares, turtleneck by Uniqlo and earrings by Asos. Top by Zara, pants by H&M and earrings by Asos. Dress by Gentlewares, scarf by Timosha vintage and earring by Asos. Trench by Gentlewares and shirt by Uniqlo. Hat and bra by Timosha vintage, pants by Zara. Photography by Larissa Bukar, fashion by Eliza Kiseleva, makeup and hair by Elena Minasova and modeling by Katrina Vihrova@Aquarelle Models.